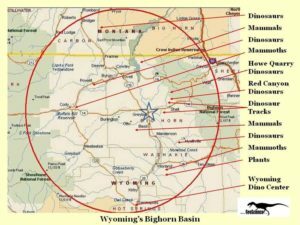 The Bighorn Basin of Wyoming contains extensively-documented fossil-bearing deposits that date from 550 million years ago (Cambrian Period) to the present. These include world-famous outcrops that contain dinosaur bones, tracksites, ancient marine reptiles, and primitive mammal fossils. These fossil sites are located both on privately-held and on state and federal public lands. One of the best known fossil sites in the Basin is the Howe Dinosaur Quarry near Shell, Wyoming. 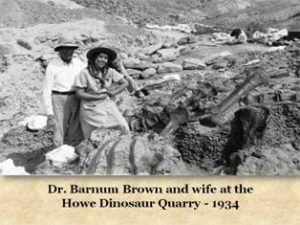 First excavated in 1934 by the famous paleontologist, Barnum Brown of the American Museum of Natural History in New York, this became world renowned for its large assemblage of dinosaur bones (over 4,000 fossilized bones), mostly sauropods, in a single area. Sinclair Oil Company financed this expedition and it was documented in major news outlets and scientific publications. Big Al Two: The most complete Allosaurus specimen ever discovered – more complete than the original ‘Big Al’, which Kirby also discovered. Siber’s team also discovered Big Al, the subject of the BBC/Discovery video entitled “Allosaur.” However, he had inadvertently strayed onto public land, instead of the private site, and this find was eventually collected by a team from the Museum of the Rockies and the University of Wyoming. See Kirby’s Saurier Museum Aathal website for additional data. 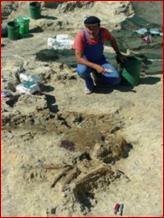 Paleontologist Bob Simon, working at the Red Canyon Ranch near Shell collected a virtually complete articulated Stegosaurus skeleton in 2004 (see image), with the assistance of dinosaur hunter Kirby Siber and his crew. In 2007, Bob again struck paydirt, uncovering a virtually complete articulated Camarasaurus, which has now been excavated and resides in a museum in Japan. The Red Canyon Ranch Dinosaur Quarry is situated on private land near Shell. Another private site, the Dana Dinosaur Quarry near Ten Sleep, Wyoming is closed now, but was until recently a major dinosaur quarry. Over a dozen individual skeletons were discovered, representing a variety of species, including predator and prey, both large and small. Paleontologists from the Smithsonian Institution, National Museum of Natural History, led by Dr. Michael Brett-Surman, collected marine reptile specimens from a Bighorn Basin site, which was discovered in 1994 by Row Manuel. A reproduction of one of the Ichthyosaur specimens, “Ikky,” is currently on display in the Shell post office. Dr. Robin O’Keefe, a biology professor at Marshall University, recently collected a previously unknown species of plesiosaur, Tatenectes laramiensis, near Greybull. 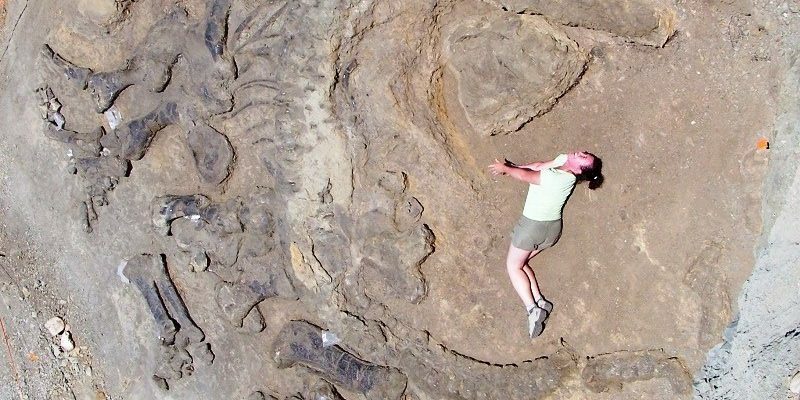 The Red Gulch Dinosaur Tracksite near Shell, Wyoming is the largest dinosaur tracksite in Wyoming, and one of two Middle Jurassic age tracksites known in the world. The tracksite area contains literally thousands of rare Middle Jurassic age dinosaur tracks embedded in oolitic limestone. Located on public land near Shell, Wyoming, this site covers 40 acres set-aside by the US Bureau of Land Management. Click here for more information on tracksites, including other major tracksites in the Bighorn Basin area. The middle of the Bighorn Basin is dotted with over 1,000 scientifically-documented fossil collection sites. The first complete specimens of Eohippus, the early dawn horse, and Coryphodon, the first large browsing animal, were discovered and collected in this area. And the Natural Trap Cave in the Big Horn Mountains contains essentially the entire record of the Pleistocene up until 10,000 to 12,000 years ago.